Click here to go to my 2012 diary. 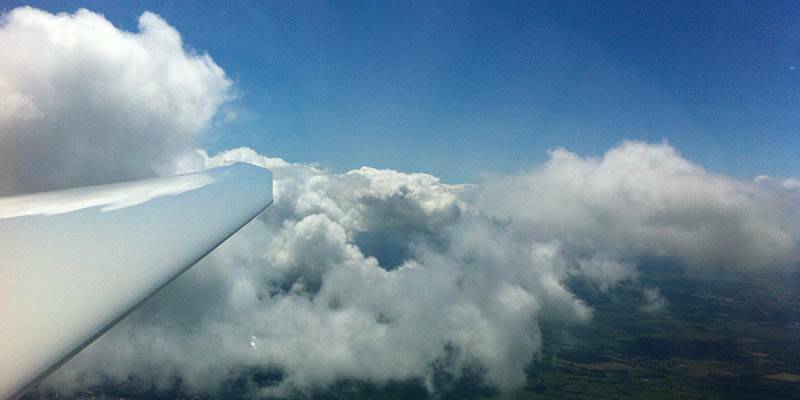 A bonus local soaring flight. 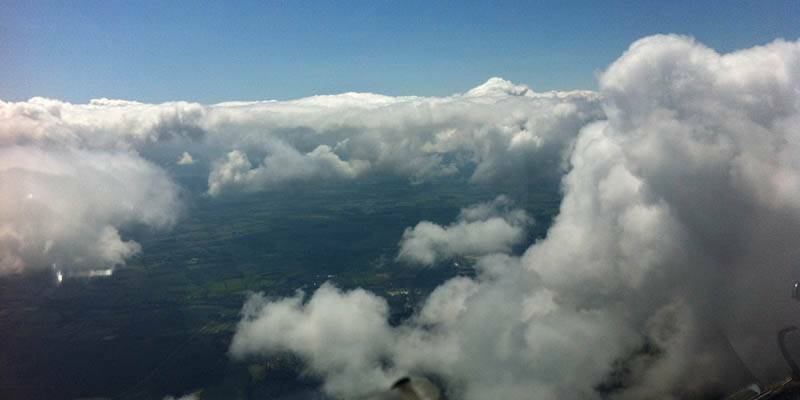 Cloudbase up to just over 4000 feet so not bad for the time of year. 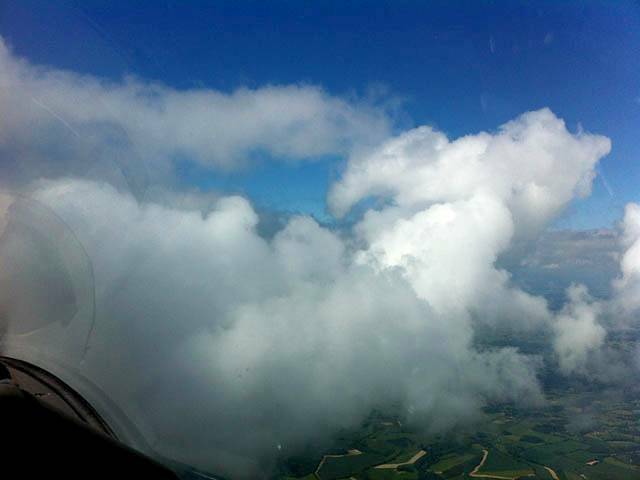 Quite windy with over 25kts at flying height, and strong narrow cores distorted and broken up a bit by the wind. Early and late in the flight cumulus was small and sometimes wispy / blue. 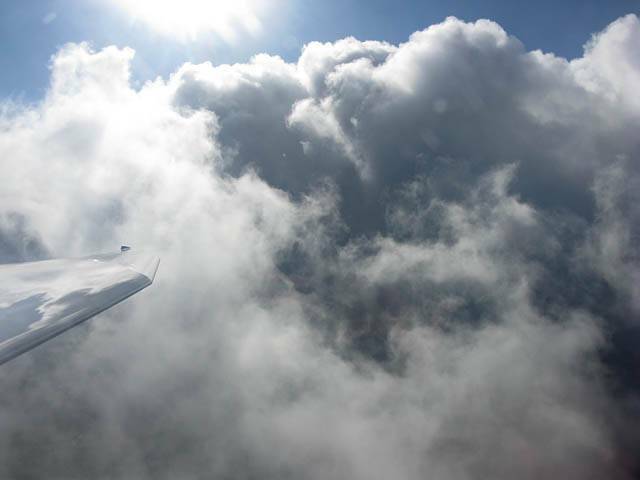 But in the middle of the flight a large spreadout street developed with a light embedded shower. I eventually fell down as it cycled down just short of 3 hours. 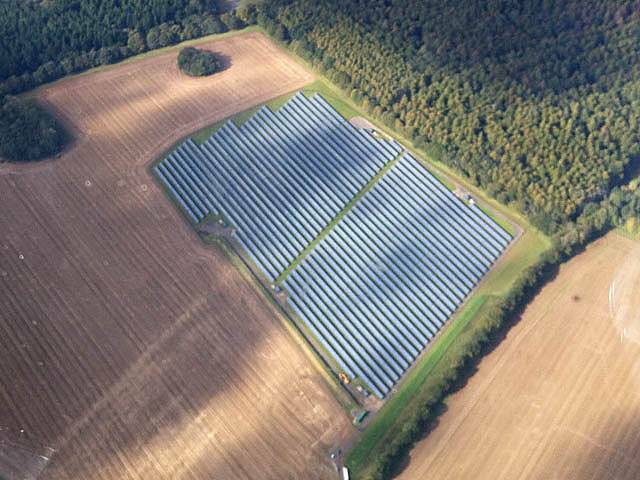 A field of solar panels to the North of the airfield and piles of dark compost next door appeared to be a good thermal trigger. Looking East across the airfield from the Northwest. Nice cloudstreet starting to form and drift in from the West. 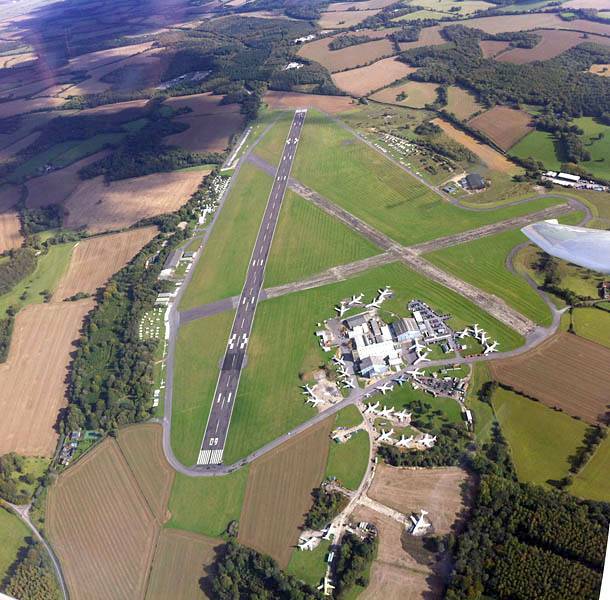 Looking down at Lasham from the West. I counted 28 jets parked at ATC Lasham, many of which are from defunct airlines such as BMI Baby and others. 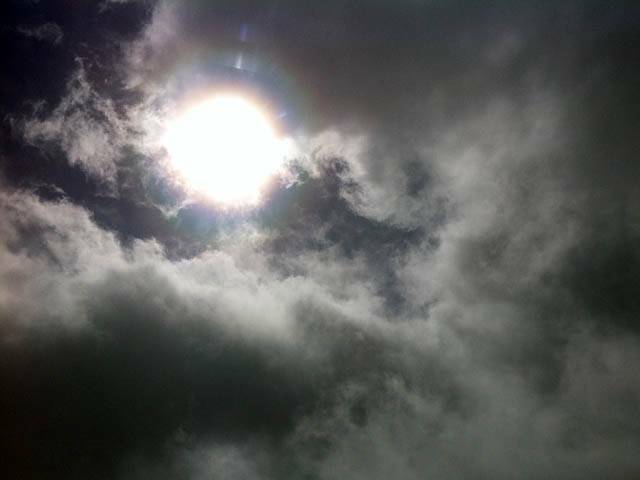 The sun shining through the clouds as I struggle into a 25 knot headwind. 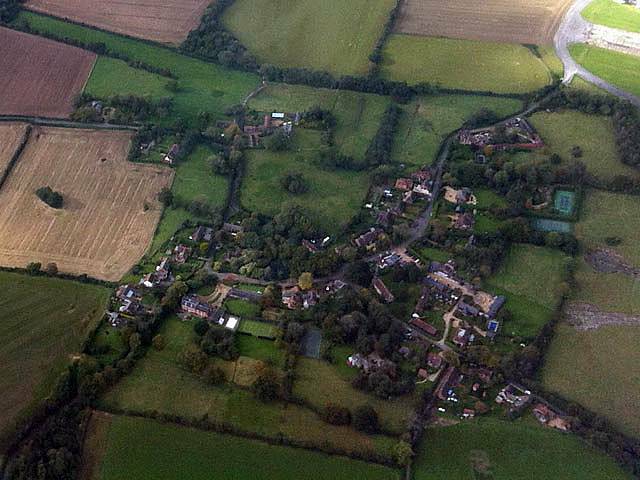 This grainy shot of Lasham village from the Southeast looks like a painting. 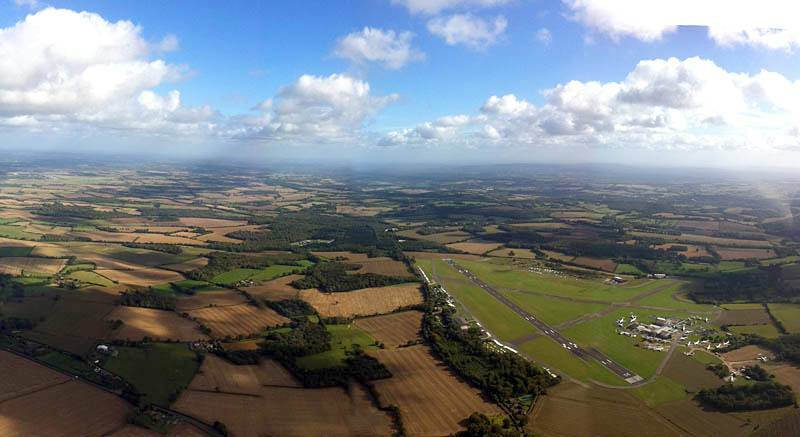 Panorama of Lasham Airfield (with Lasham village in shot) from the Southeast. 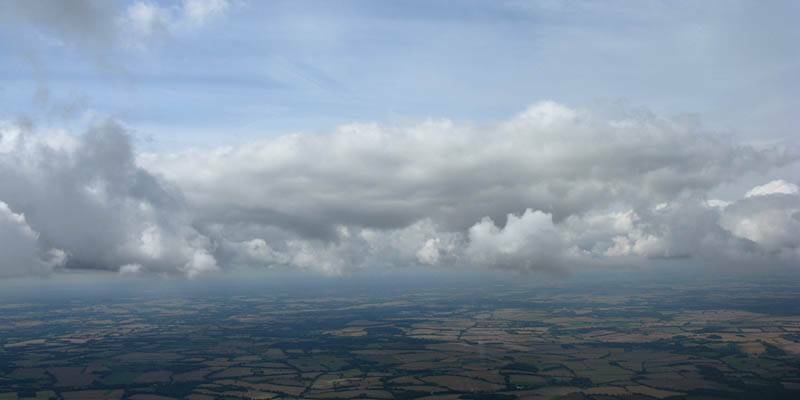 Roughly 180 degree panorama from South through West to North from near Lasham Airfield. 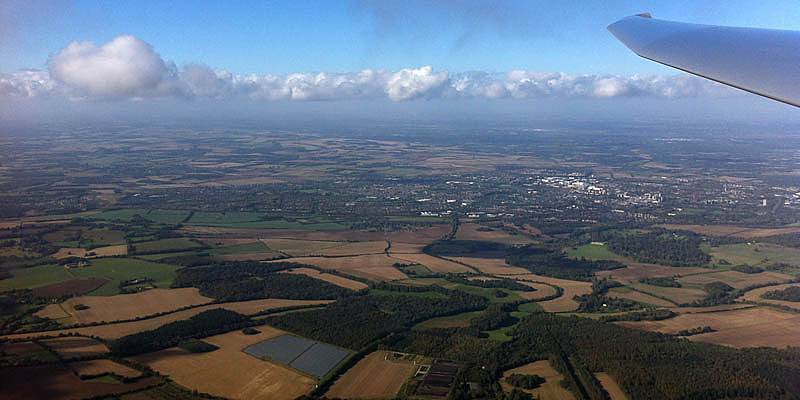 Basingstoke and those solar panels visible to the North. 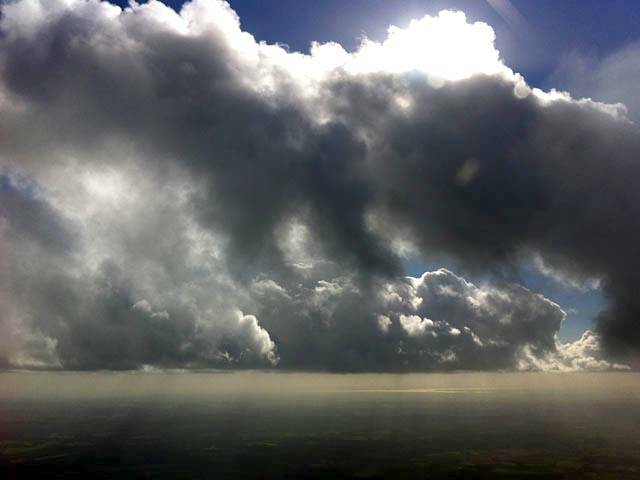 Nice backlit cloudscape to the South. 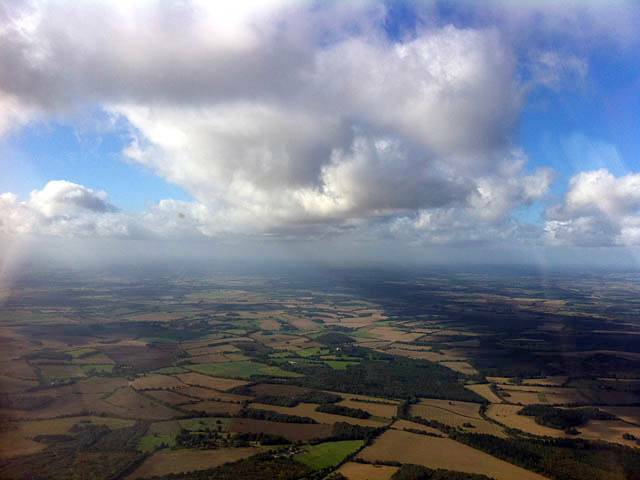 Looking North towards Basingstoke as conditions cycle down a bit. The solar panels and compost heapsd visible in the foreground. 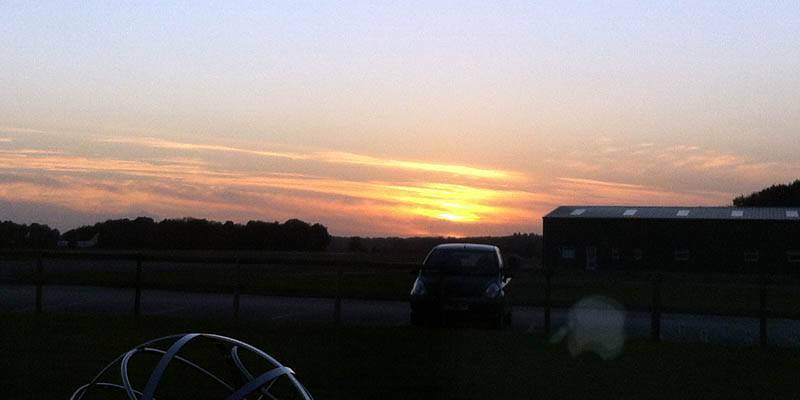 Back at the launch point I made a new friend... Sunset from the clubhouse at the end of a nice fresh breezy day. 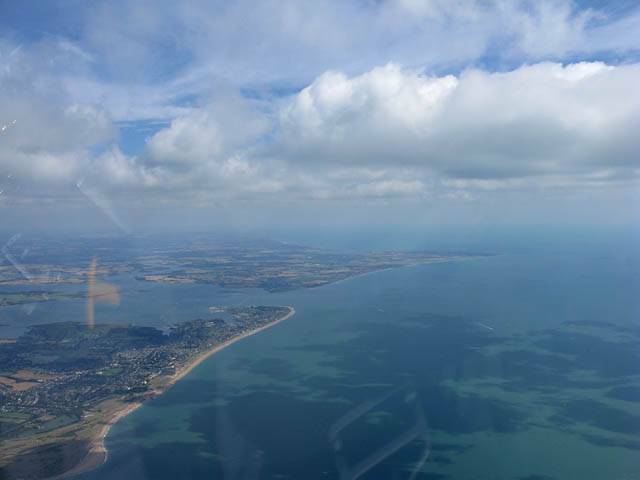 Today, after an early leg to Newbury South, I flew South to Cocking before heading Westwards towards Portsmouth, taking in the gorgeous views of the South Coast in cystal clear conditions. 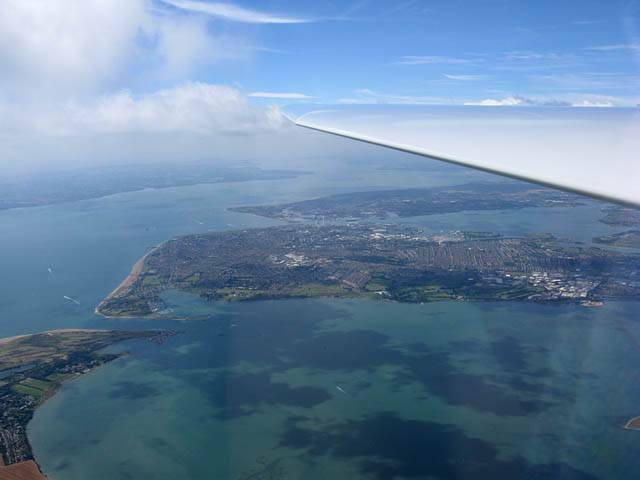 The pictures were all taken as I headed South over Hayling Island, then out a couple of miles into the Solent before returning via Portsmouth. 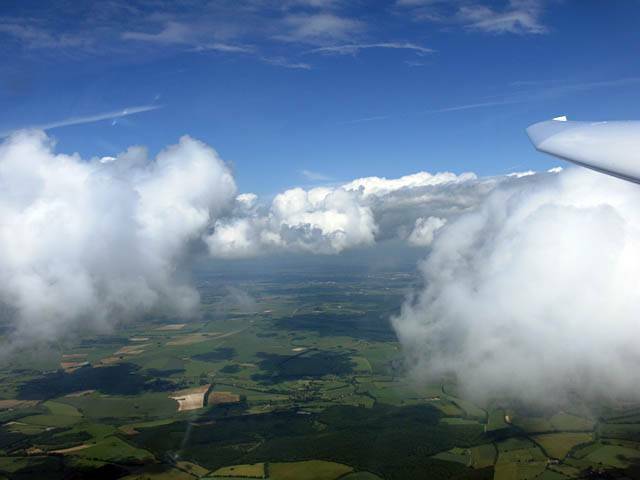 From there I headed back to Lasham to finish the flight. 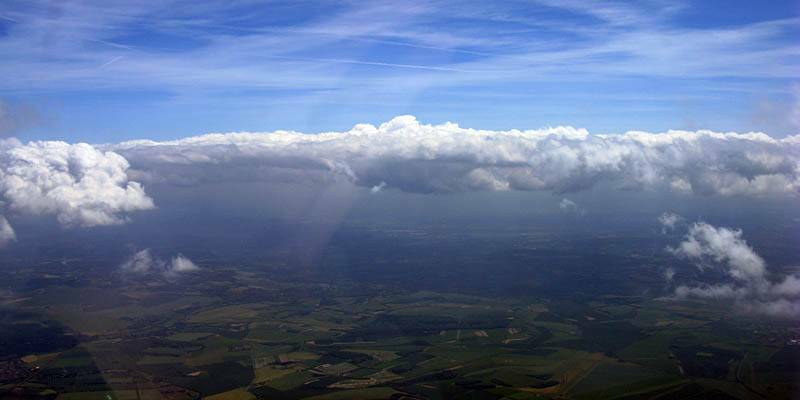 I was eyeing the Isle of Wight but I bottled it as conditions of the Isle of Wight didn't look so good after the cumulus in the middle of the solent where I turned round. It didn't matter though as that area was eye candy anyway and well worth visiting in the way I did. 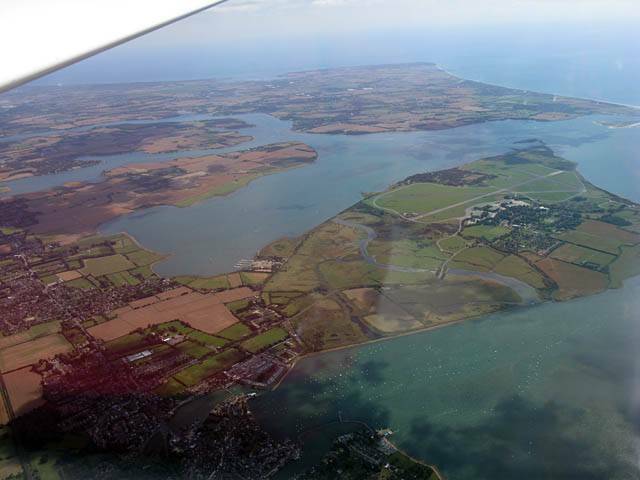 Hayling Island from the North. 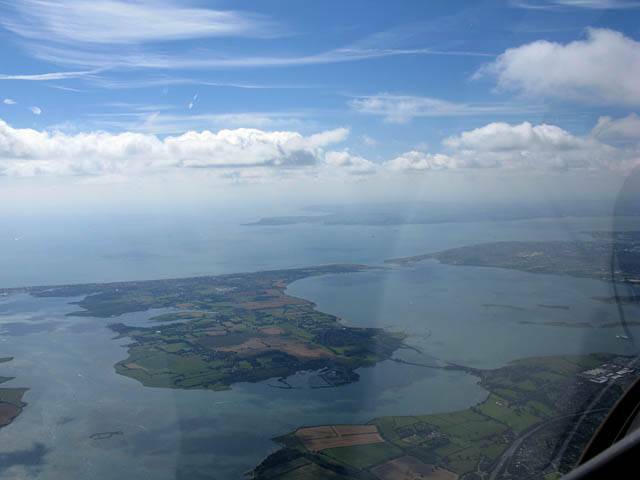 Thorney Island from the West with the Selsey peninsula visible in the background. 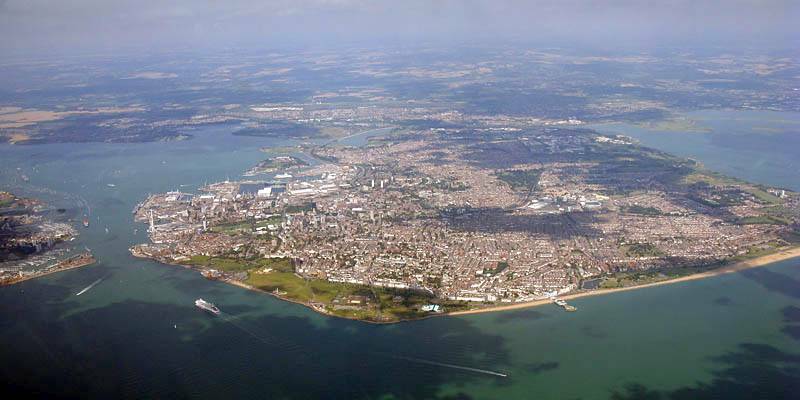 Portsmouth from the East over the middle of Hayling Island. 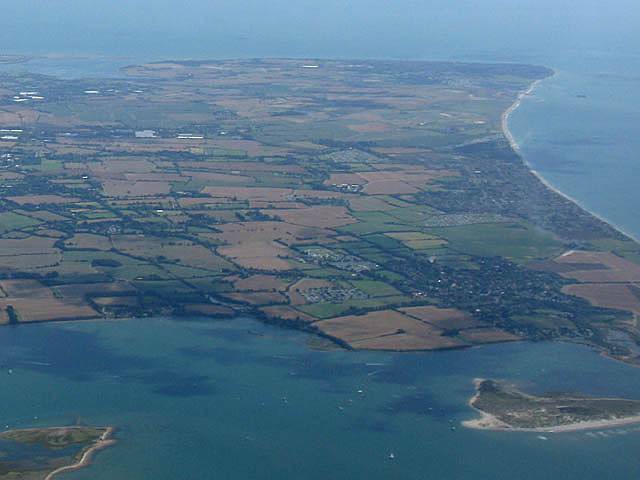 A long range view of Selsey. 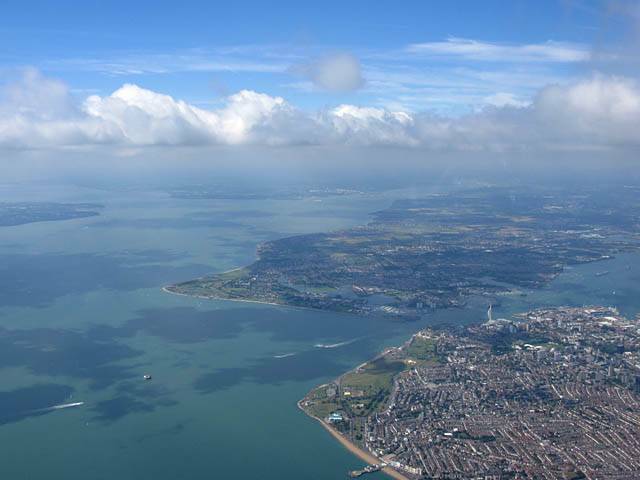 Looking West along the Solent from the South Coast of Hayling Island, past Portsmouth and Gosport towards Southampton. Portsmouth and the Spinnaker Tower from the Southeast as I head out to sea a bit. Looking South to the Isle of Wight. 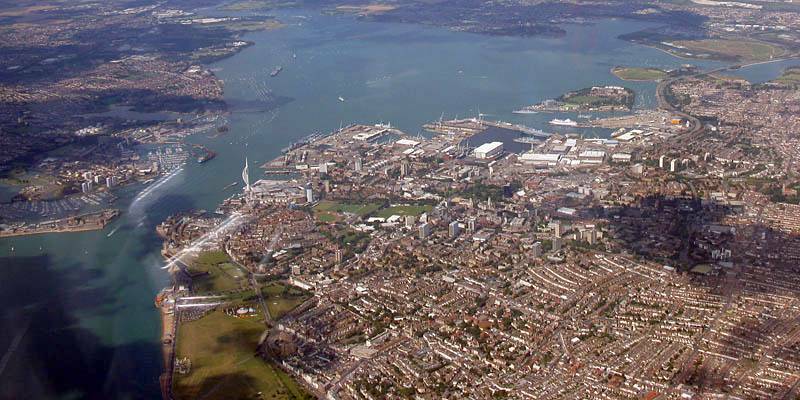 Portsmouth from the South over the Solent. 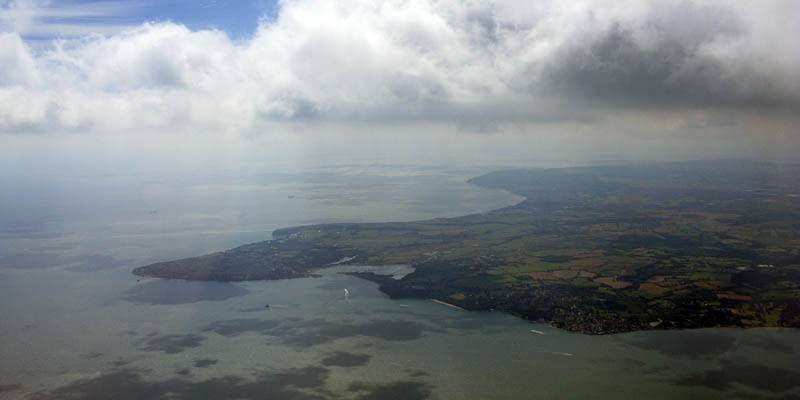 Looking East from the middle of the Solent, back past Hayling Island towards Selsey. 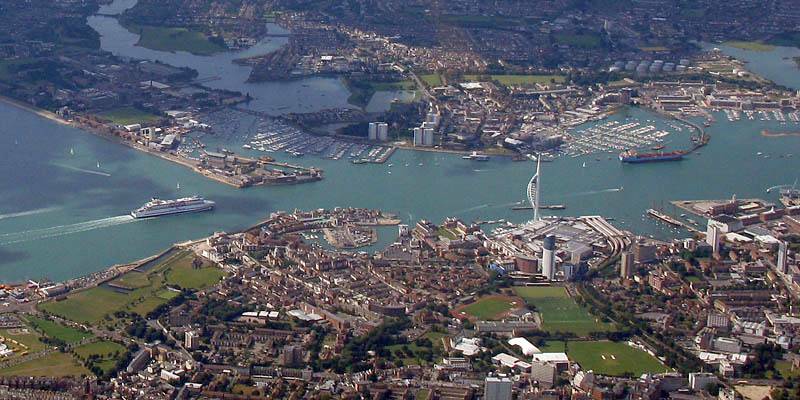 A closer look at the channel between Portsmouth and Gosport, where Gun Wharf Quay and the Spinnaker Tower are. This as I head North and back inland. Today was characterised by increasing amounts of spreadout and top cover as the day went on. As a result I didn't go too far. 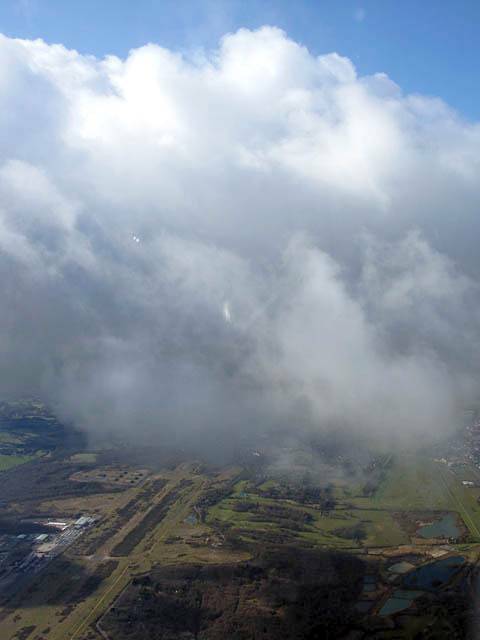 But the highlight was a cloudclimb to 6300 feet over Kingsclere. 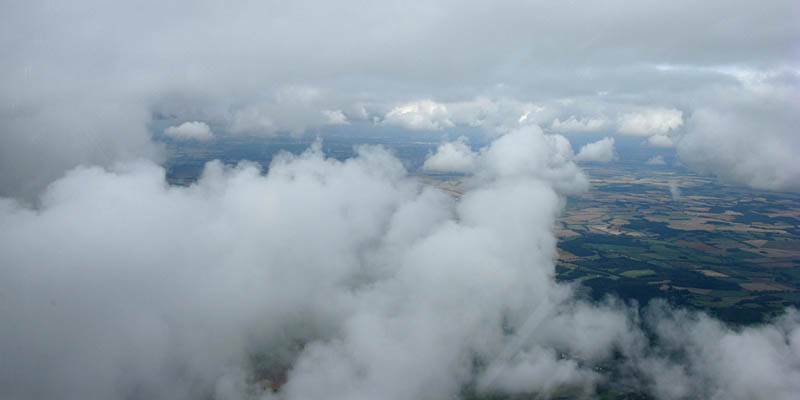 This was over 2000 feet above cloudbase. 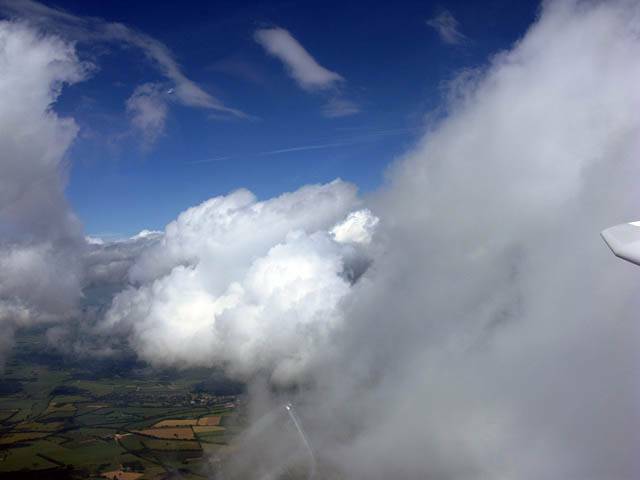 I never tire of getting above cloudbase! 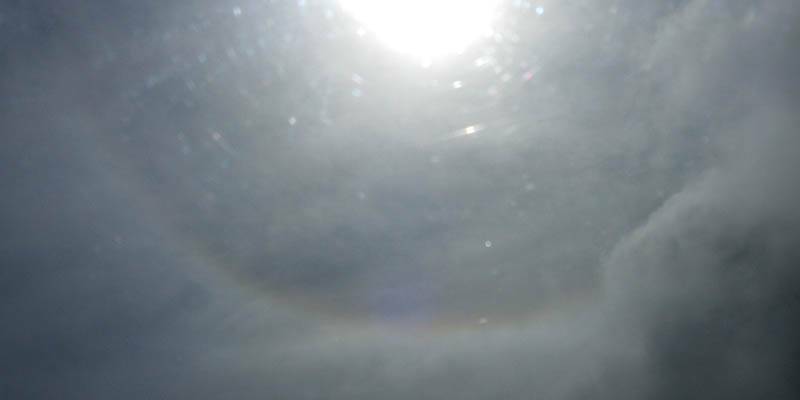 A 22 degree halo indicating that there is already thin top cover above. Nice conditions early on. Bad spreadout and gaps starting to form. But nice lift under the streets. Up at 6000 feet after the cloudclimb. 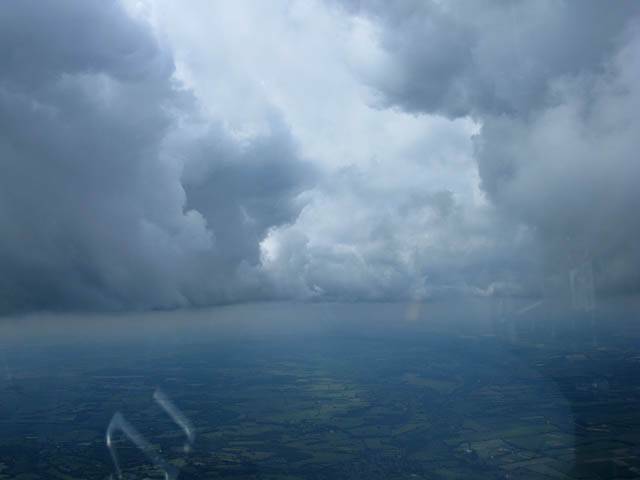 Descending from 6000 feet near Newbury after the cloudclimb. Lots of little wispy clouds below. 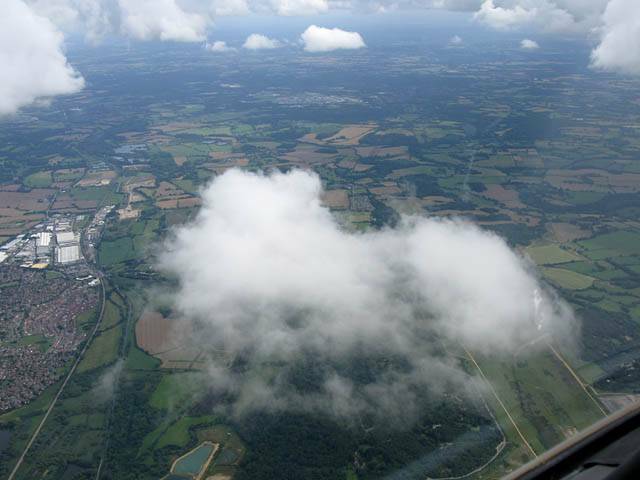 A cloud between me and Greenham Common. 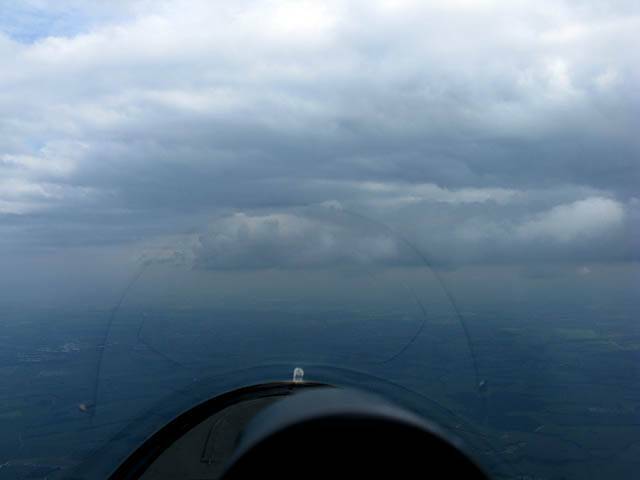 Heading back across a gap towards Lasham. 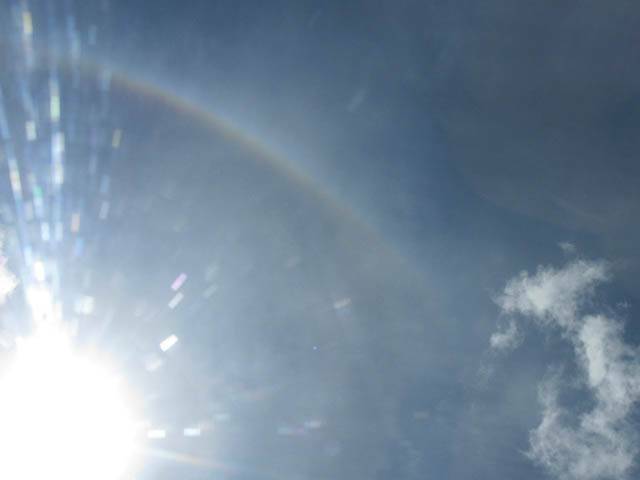 Another shot of the 22 degree halo as the top cover thickens. 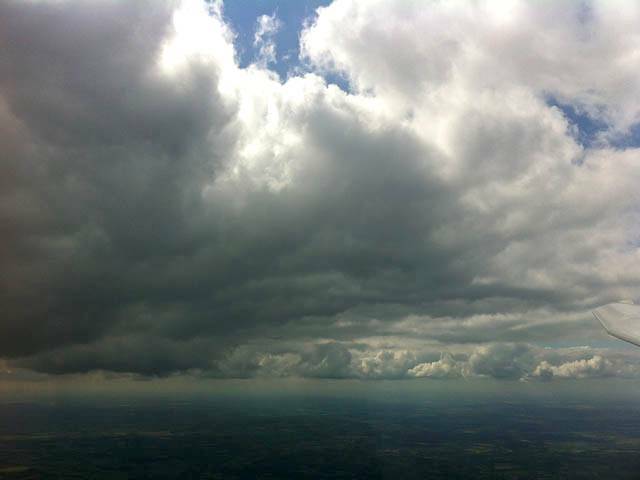 These pictures highlight two big cloudclimbs taken today, as well as, once again, worsening spreadout. 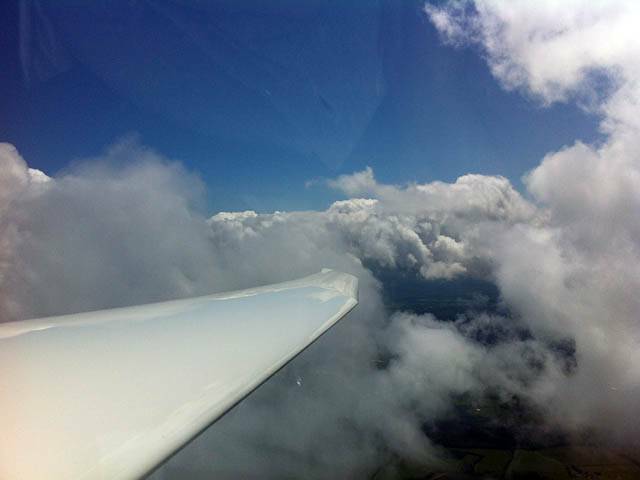 The first cloudclimb was to 7000 feet over Burbage, en route to Devises. 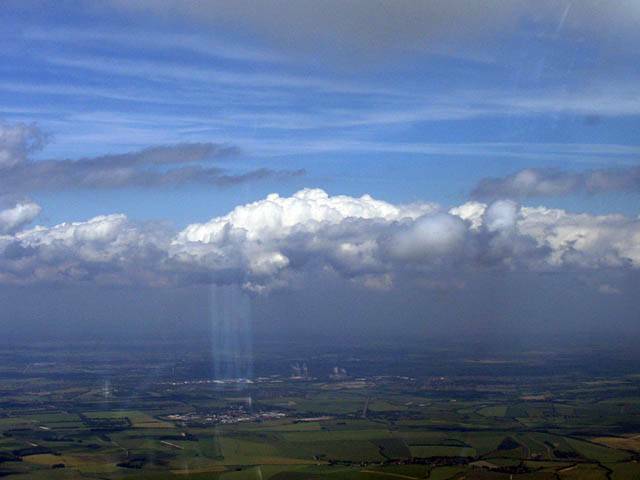 The second cloudclimb was over Didcot Power Station, riding the Didcot Special (very strong and turbulent!) all the way to 8200 feet. The last two shots show the killer spreadout brewing as large areas of widespread lift form under big dark cloud streets before the spreadout kills the convection off by cutting off the sun. No video this time but just as exciting the flight was! 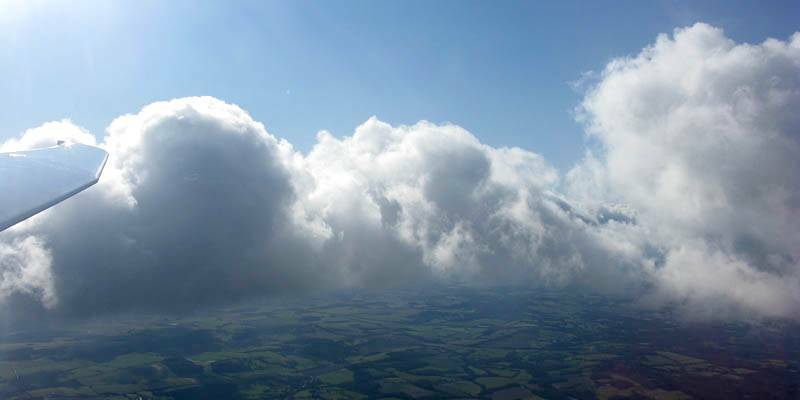 Views above cloud as I descend from 7000 feet. 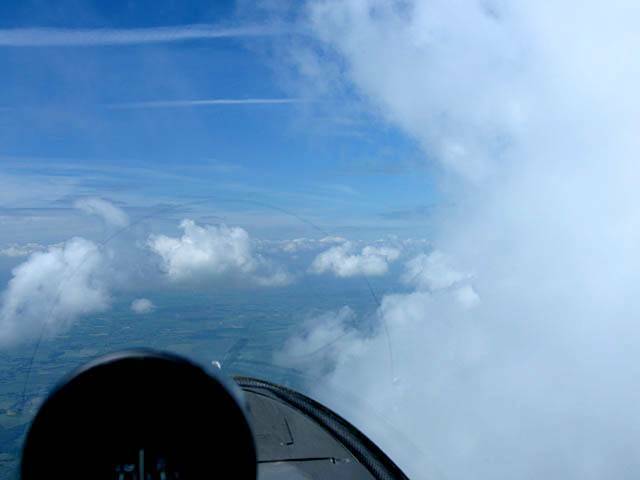 Ahead the encroaching top cover can be seen, as well as smaller clouds and a gap towards Devises. 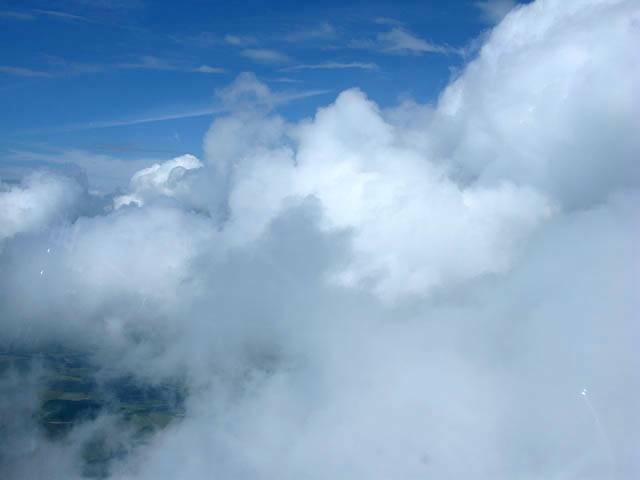 Life up in the clouds is grand! Approaching the Didcot Special thermal from the West. The funnel of lower wisps above the chimney just visible. 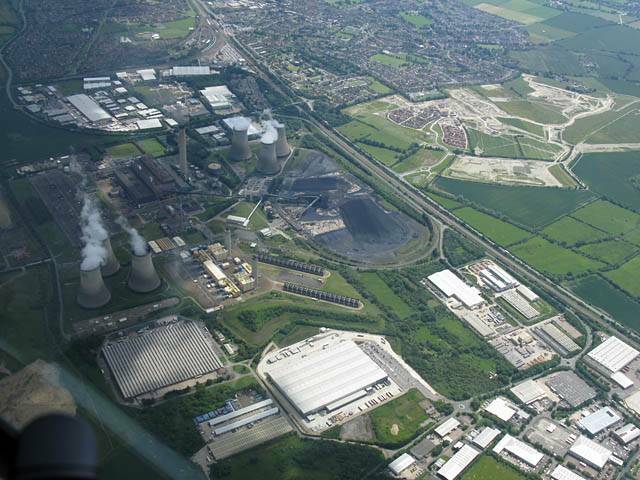 Didcot Power Station from above. The chimney in the centre is the thermal source. 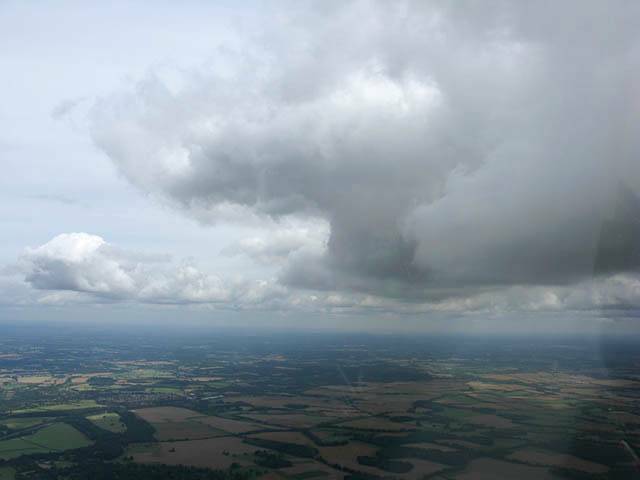 First shot up at 8000 feet after exiting the Didcot Special. Attempting to look behind me back at the Didcot Special cloud. Top maybe 10,000 feet. 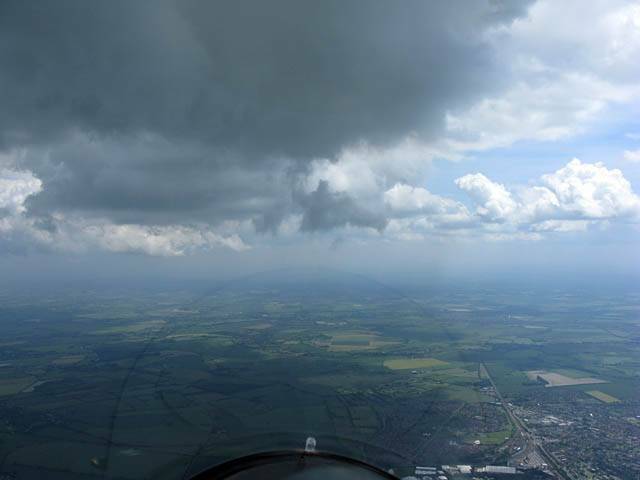 Looking Southwards across a large gap towards Chievely. I am about level with the spreadout layer at this height. Looking back Northwards towards Didcot from the South side of the gap. 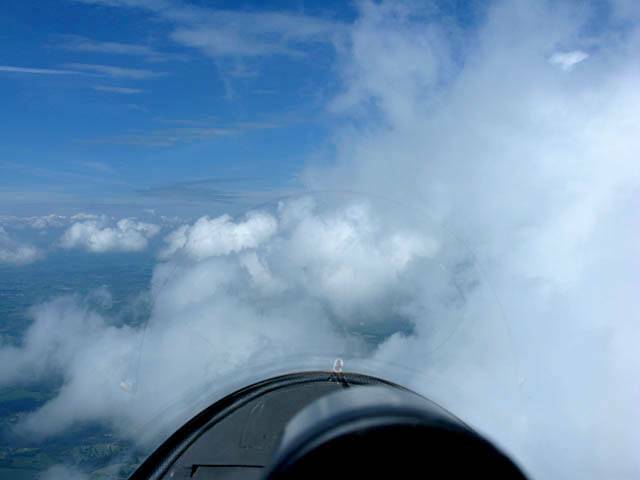 Worsening spreadout and top cover near the end of the flight. Please click here to view the You Tube video. 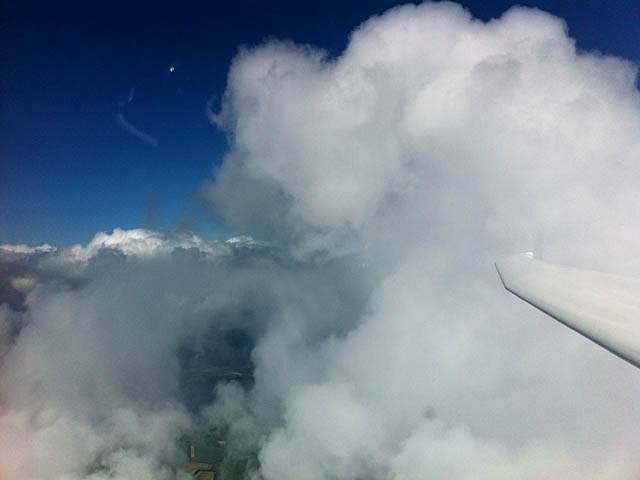 Views above cloud as I descend from 7000 feet surrounded by large cumulus and spreadout. My favourite shot. 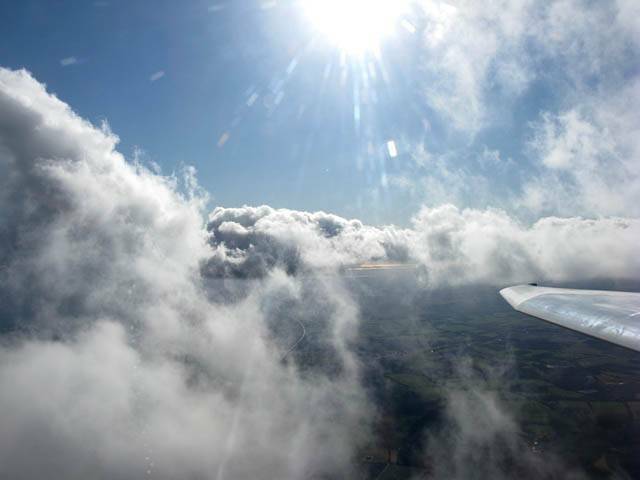 Descending back towards cloudbase. Looking across a large spreadout gap to the South. Better conditions the other way. Spreadout getting worse, but still good under this street. 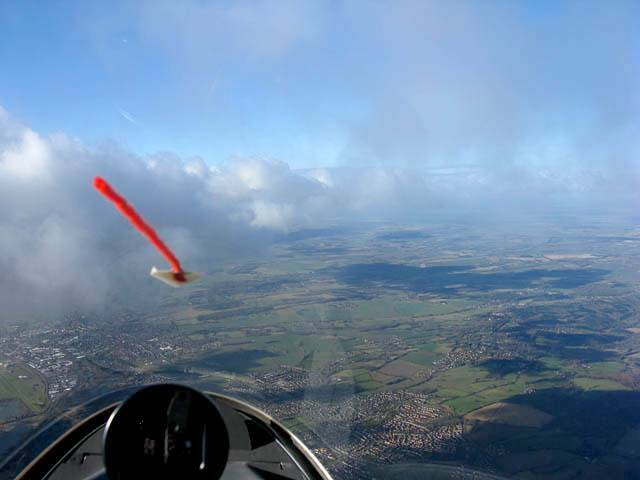 More shots as the spreadout worsens further near the end of the flight. 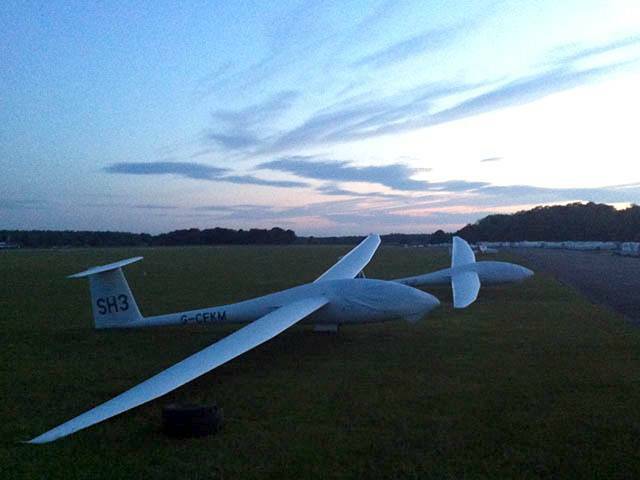 Gliders parked up outside overnight as it gets dark. 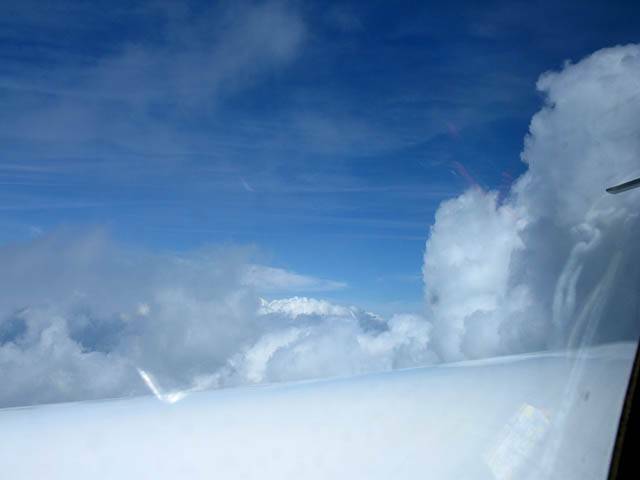 The highlight of this flight was watching spectacular cumolonimbus clouds build on a trough line far to the Northeast. 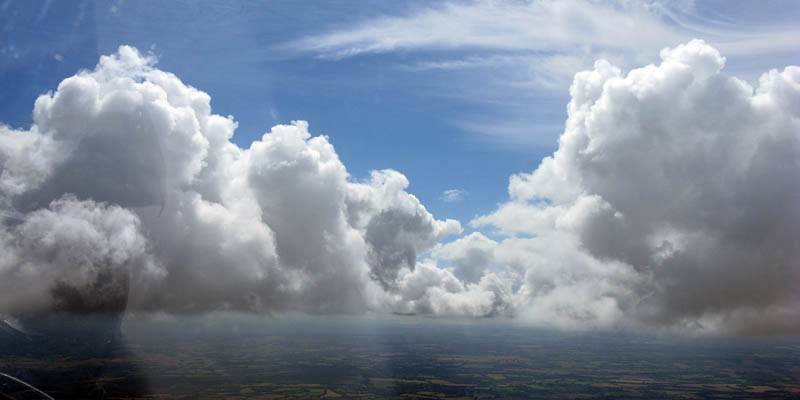 Their orangey tinge due to their distance made them stand out against the more local shallow cumulus. The main camera had died so I had to use the iPhone camera. Shame I couldn't zoom but it still set the scene nicely. 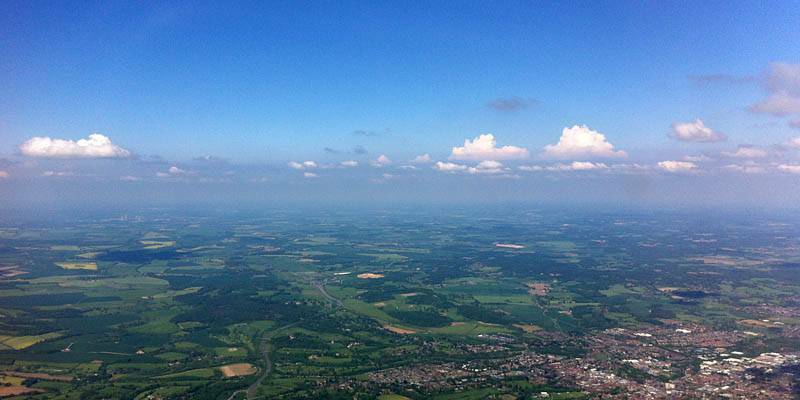 Newbury panorama, taken from the Southwest. Looking at building cunims from Newbury. 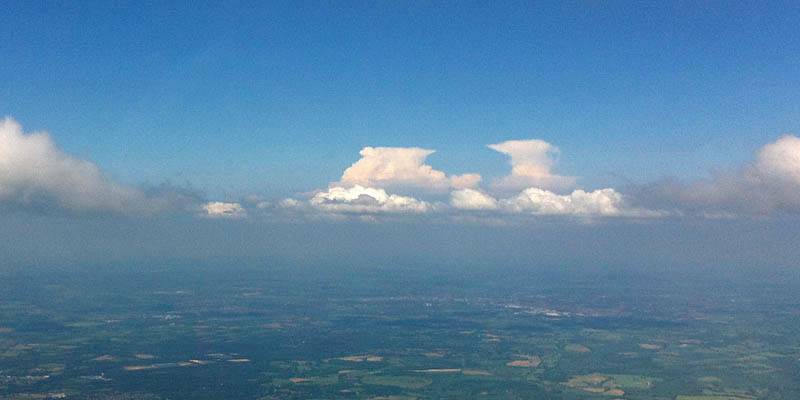 The cunims have developed anvils by the time I get back to Basingstoke. 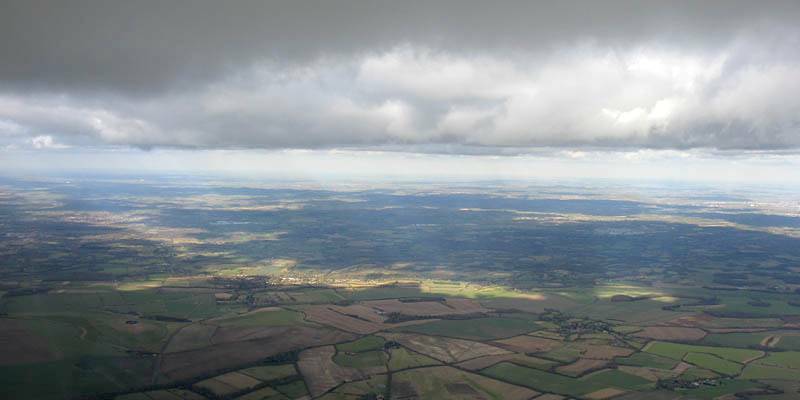 Panorama showing multiple distant cunims to the far Northeast from Basingstoke. 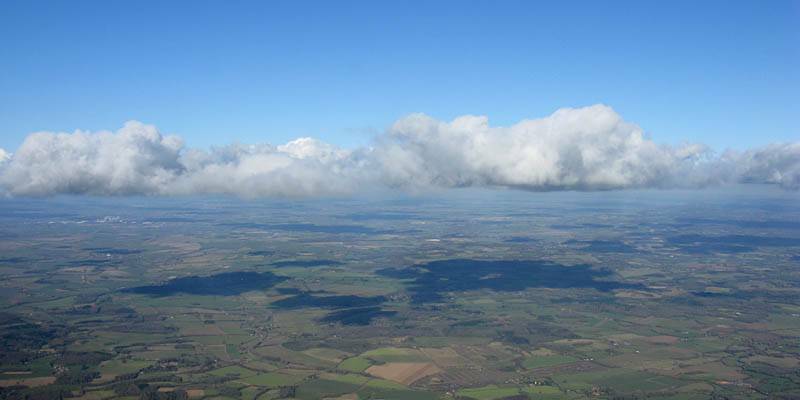 360 degree panorama taken not far below cloudbase close to Basingstoke. Incoming top cover can be seen to the Southwest, as well as the cunims on the trough to the Northeast. 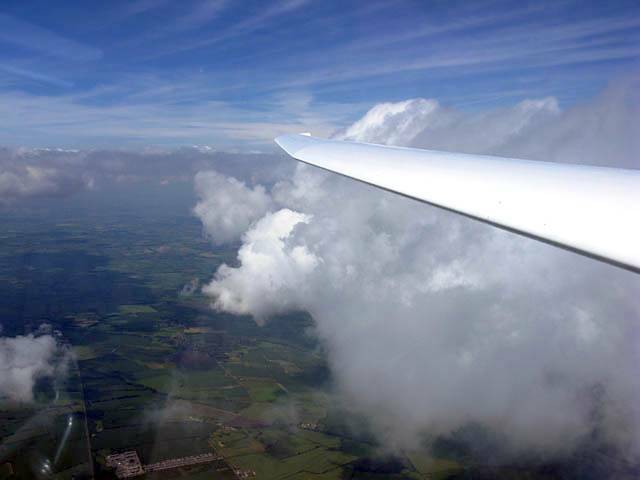 An unexpectedly early soaring day. 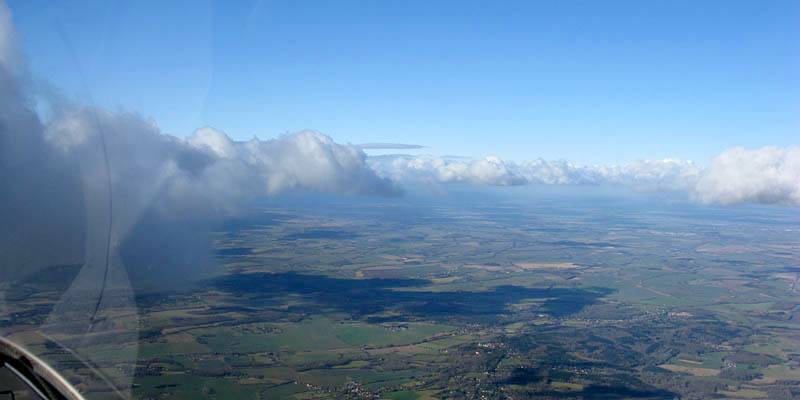 It was only about 5C on the ground, and it was about -10C up at cloudbase which got as high as 4500 feet above Lasham. 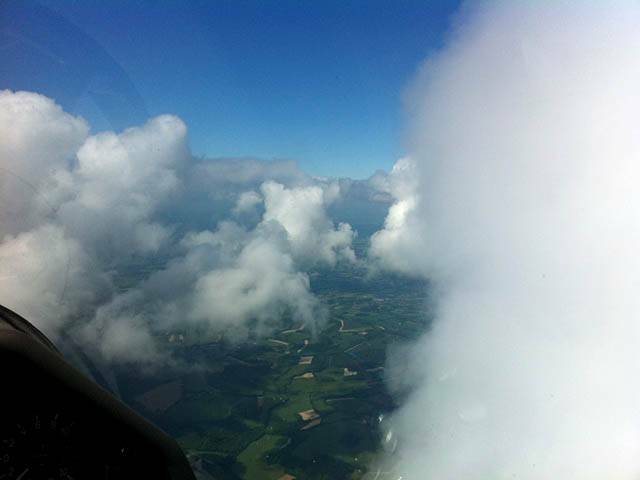 I also took a couple of cloudclimbs, topping out at 5100 feet above Lasham / 5700 feet QNH in the Newbury area. I'm glad I took the camera with me. 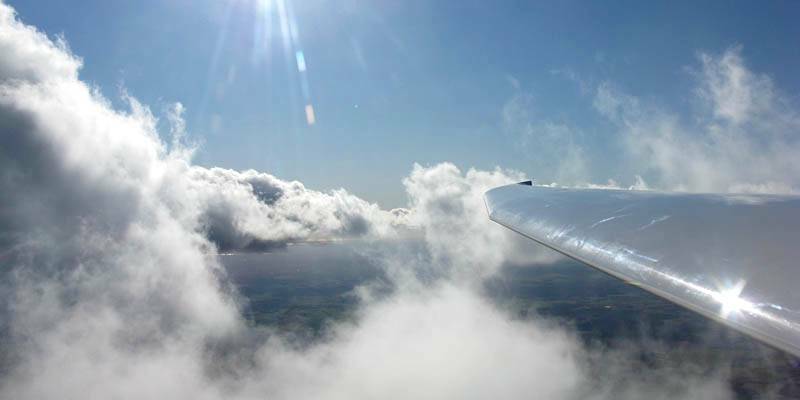 So nice to get soaring again. Although 3 hours in the freezer took its toll with the frozen feet, especially once bigger clouds arrived cutting the sun down. 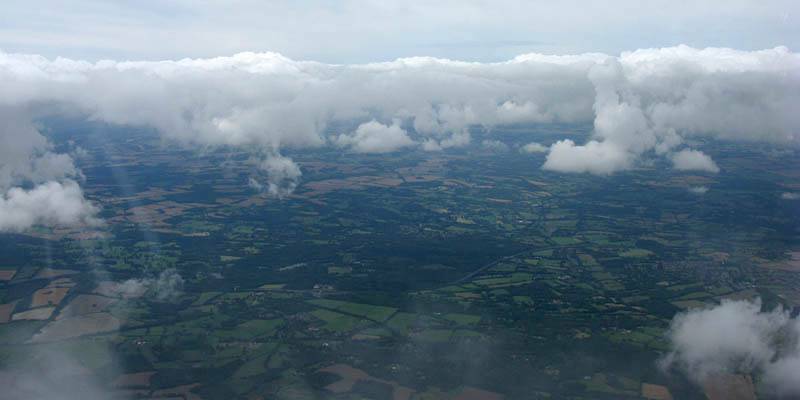 Above cloudbase between Newbury and Aldermaston. 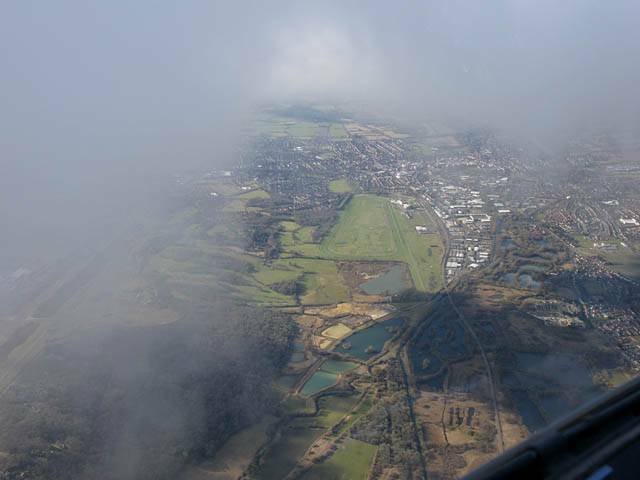 Newbury Race Course seen through a gap in the cloud. 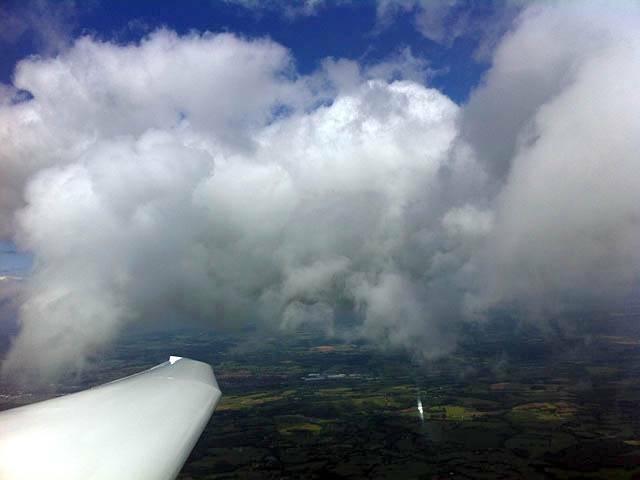 Looking back towards Lasham. 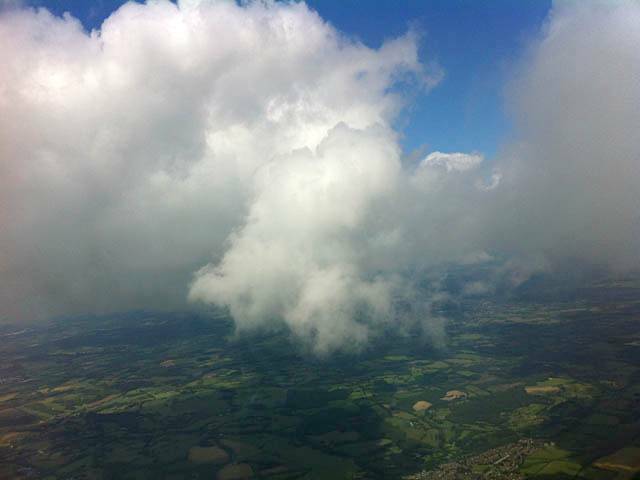 More above cloudbase shots. 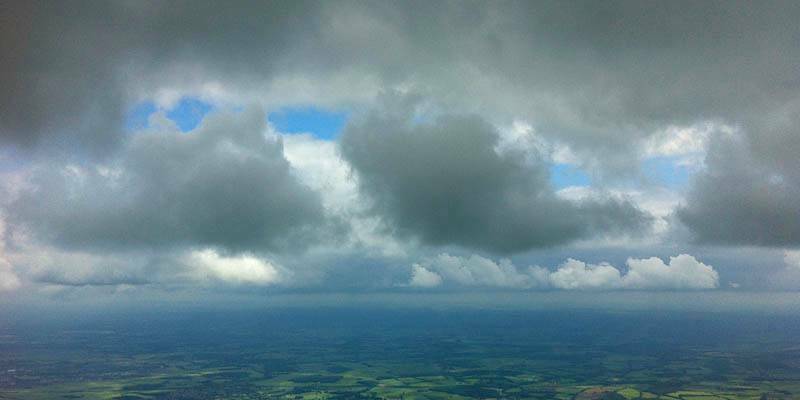 One more above cloudbase shot. Looking South from between Kingsclere and Basingstoke. Visibility was over 50km! 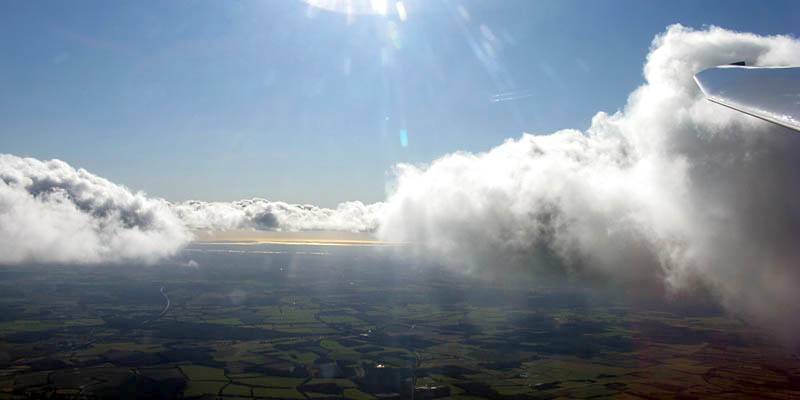 Thicker cloud coming in from the Northwest on the brisk 35kt flying wind. 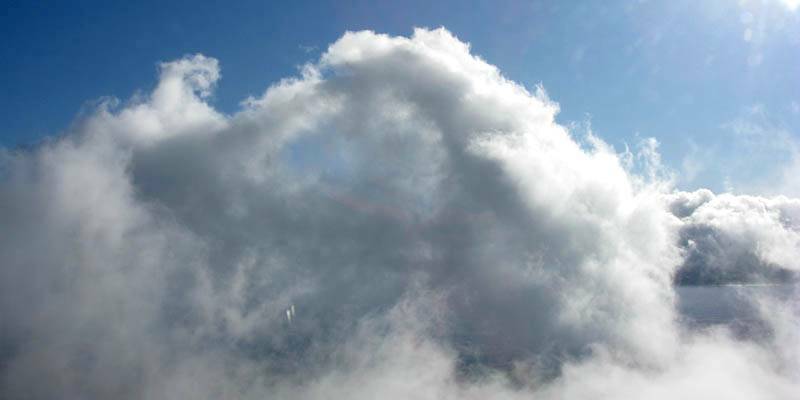 Looking East from under the big cloud.